We can supply the following types of replacement Walbro Carb Parts: Carburetor Bowls, Carb Kits, Carburetor Screens, Floats, Pins and Kits, Nuts, Bolts & Screws and Welch Plugs. When you need replacement parts for your Walbro Carburetor Rebuild or Walbro Carb Adjustment, try Jack’s first! All Walbro Carbs have a model number stamped into the Carb to help you find the correct replacement parts for your project. 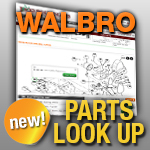 Simply select the Walbro Carburetor Parts category you need.